Appointments are strongly recommended. Please call the office in advance to schedule a meeting. Closed Saturday, Sunday, and all major holidays. 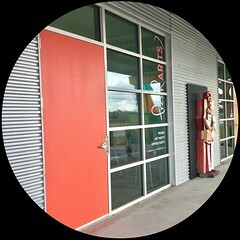 Fresh Arts' office is located inside The Silos at Sawyer Yards and headquartered in Arts District Houston. TIP: Our front door is orange and accessible from the front loading dock which faces Sawyer Street (look for the giant ART sculpture). Free parking is available in the parking lot directly in front of Fresh Arts office door, with additional parking surrounding The Silos. * Fresh Arts refers to the organization created from the merging of Spacetaker and Fresh Arts Coalition in 2012.